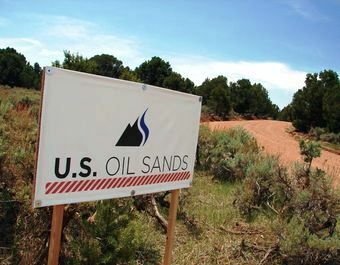 U.S. Oil Sands, a Canadian company, has leased about 32,000 acres in Utah for tar sands mining. Environmental groups, especially Utah-based Living Rivers, oppose the project. Bitumen, a black sticky substance that native Americans used to call “rocks that burn,” is now commonly called tar sands oil. In Utah there is a lot of it. Enough, it is estimated, that if it is mined for oil extraction it could supply US energy needs for three full years. That’s 25 billion barrels of oil. As with most mining and oil production operations, however, there is a down side. One, the area in Utah where a Canadian company is planning to establish a bitumen mine, is water poor, and tar sands mining is a very water intensive endeavor. Second, water tar mining also uses chemicals that aren’t easy to get rid of, and waste products from the mining process present disposal problems that haven’t been fully addressed. The oil sands region gets only 10 to 12 inches of rain a year and Utah is the second driest state in the nation, behind only Nevada. The U.S. Oil Sands operation is built around an extraction process that uses d-Limonene (pronounced de-lie-mo-neen), a liquid with a lemon-like smell made of oils pressed from the skins of oranges, lemons, limes and grapefruits. Small quantities of d-Limonene give cookies and candy a fruity taste. It’s also used as an industrial solvent in removing asbestos shingles and cleaning concrete. The U.S. Environmental Protection Agency has run limited tests on d-Limonene and includes the substance on its Generally Recognized as Safe List. But its report on d-Limonene says that determination was based on small quantities used to flavor foods. In large doses, laboratory rats got sick when exposed to the chemical. Tar sands mining poses many unanswered questions. For much more information on the tars sands controversy in Utah, see the Inside Climate News.